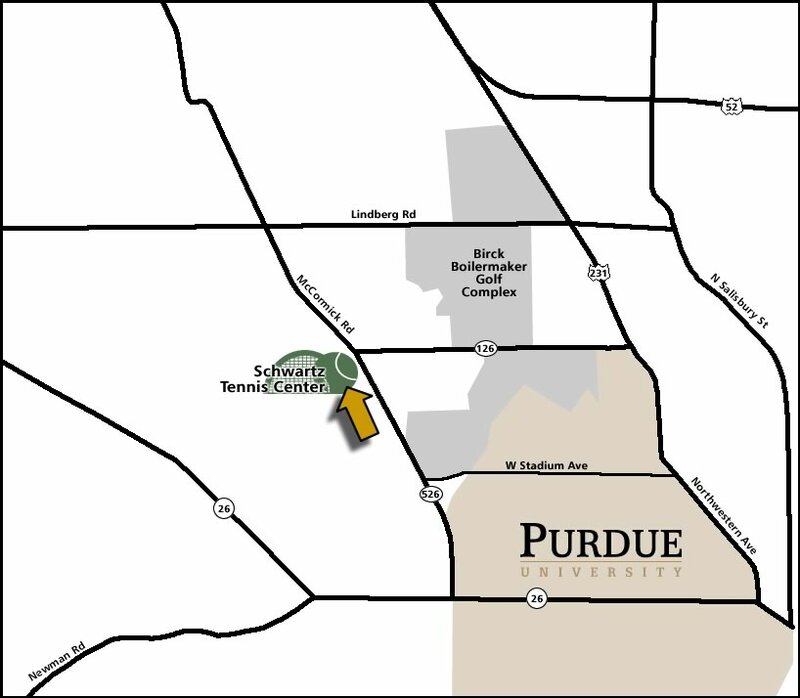 The Schwartz Tennis Center is located near the intersection of McCormick Road/St. Rd. 526 and Cherry Lane, just north of the Purdue campus. Free parking is available at the tennis center. Head west on Columbia Street (St. Rd. 26), through downtown Lafayette and across the Wabash River. St. Rd. 26 will become State Street; follow this into West Lafayette and through the Purdue campus. Turn right onto McCormick Road( St. Rd. 526/Airport). The Schwartz Tennis Center is about one mile ahead on the left, just before Cherry Lane. Take St. Rd. 231 North to St. Rd. 26 (State Street). Turn left. Follow to McCormick Road(St.Rd 526/Airport) and turn right. The Schwartz Tennis Center is about one mile ahead on the left, just before Cherry Lane. Take I-65 north to St. Rd. 43 South (Exit 178). Follow to St. Rd. 26 West (State Street) and turn right at the McDonald's. Follow to McCormick Road(St. Rd 526/Airport) and turn right. The Schwartz Tennis Center is about one mile ahead on the left, just before Cherry Lane. Take US 52 East/US 231 South into West Lafayette. It will turn into Northwestern Avenue. Turn right on Cherry Lane and follow until it ends at McCormick Road(St. Rd. 526). Turn left and the Schwartz Tennis Center is on the right. Take I-65 south to St. Rd. 43 South (Exit 178). Follow to St. Rd. 26 West (State Street) and turn right. Follow to McCormick Road(St. Rd. 526/Airport) and turn right. The Schwartz Tennis Center is about one mile ahead on the left, just before Cherry Lane.